KID’S HEALTHFAIR Thursday, October 25th from 3:30pm-7pm in the Berne Class Room (Flu Shots) & Trick –or- Treating Throughout at Adams Memorial Hospital. Kids can receive their flu shot for $32 and then Trick- or- Treat throughout the hospital. Adult flu shots also available for $32. MAMMOGRAPHY NIGHT Monday, October 1st from 4pm-7:30pm in the Radiology Department at Adams Memorial Hospital. In addition to mammography screenings, we will have mini massages, POSH treatments, goody bags, and refreshments. The screenings are billed to insurance and we encourage new patients (those who have not had a mammogram before or those new to AMH, or patients that have not had a mammogram in the last 5 years) to come to the event. Some grants based on financial eligibility are available through the Indiana Breast Cancer Awareness Grant. Please call Central Scheduling at 260-724-2145 x11047 to make an appointment. RED CROSS BLOOD DRIVE The next Red Cross Blood Drive will be held on Friday, October 19th from 10am-4pm The American Red Cross is bringing their mobile unit in the Strickler Cancer Institute parking lot on the Adams Memorial Hospital Campus. To schedule an appointment please call 260-724-2145 x11050. LEAGUE OF THE BLIND & DISABLED A new support group for the blind will be held on the 3rd Tuesday of each month. The next meeting is on Tuesday, October 16th from 1:15pm-2:30pm at Adams Memorial Hospital in the Geneva Room. Come and learn resources and find support. women in this area who meet financial criteria. Women who qualify, will receive free mammography services at AMH, along with a diagnostic reading by Summit Radiology. Women should call the AMH Central Scheduling Department at 724-2145 x11047. NAIL CLINIC & FOOT SCREENS Free Foot Screenings Wednesday, October 10th from 5:30pm-6:30pm in the Geneva Room at Adams Memorial Hospital. By Northeast Indiana Foot and Ankle Clinic. Nail Trimming Cost: $25 A great service for seniors or others that need assistance with nail care/trimming. By Northeast Indiana Foot and ankle clinic. Call 724-2145 x11068 to schedule. COMMUNITY HEARTSAVER CPR & FIRST AID Monday, November 5th from 5pm-9pm Call 724-2145 x12256 to register. All classes are held in the Monroe Room at AMH. Cost is $50, 12 student limit. 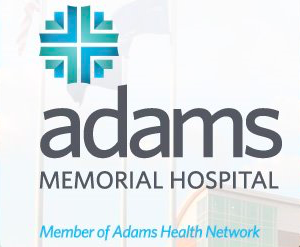 WEIGHT WATCHERS DECATUR Weight Watchers hold their weekly meetings at Adams Memorial Hospital on Thursday evenings. Weigh-in time is from 6pm-6:30pm, and the meeting is from 6:30pm-7pm. Meeting are held in the Monroe Room at AMH. AMH MATERNITY CENTER OFFERS CHILDBIRTH EDUCATION CLASSES The next maternity class is Saturday, November 10th from 9am to 3pm in the Monroe Room at AMH. Learn about “epidurals” and other options for pain relief, as well as how to know when you are in labor, what to bring to the hospital and partner support. We also help you know what to expect, and learn how life changes after the baby is born. The cost is only $20 for those families delivering at AMH. Please call Sharolyn Faurote at 260-724-2145 x12500 to schedule. MOM’S SUPPORT GROUP A support group for mothers will be held on Mondays in October beginning at 1pm. The meetings will be held in the OB Department Education Room at AMH. Come talk to other moms, share experiences, and get help with breastfeeding questions. For new mothers and pregnant women, babies welcome! DIABETES CLASS AMH Diabetes Connection will be holding their monthly diabetes class on Thursday, October 23rd from 8am to 3:00pm in the Strickler Cancer Institute Library. The class will focus on carbohydrate counting and dietary management, foot and skin care, exercise, the emotional aspect of diabetes, self-monitoring blood glucose meters, and how often to check glucose levels, lifestyle hints to help control blood sugar, how specific drug classes prescribed for diabetes work, drug side effects, and drug interactions. Please call 260-724-2145 x11107 to register. ALZHEIMER’S/CAREGIVER’S SUPPORT GROUP The next Alzheimer’s support group meeting will be held on Thursday, October 18th from 3pm-4pm on the 3rd Floor of AMH in the Senior Life Connections Department. The Alzheimer’s/Caregiver’s Support Group is designed to help ease the burden of the caregiver of dementia patients or others in a loving and confidential setting. The SilverSneakers Exercise Program is held on Mondays, Tuesdays, and Thursdays at 9:30am at Adams Memorial Hospital in First Floor Classroom. Call the WFC for more information at 260-724-2145 x11036. Is Your Business Ready For The Holidays? Family LifeCare of Berne and Marion Growth!